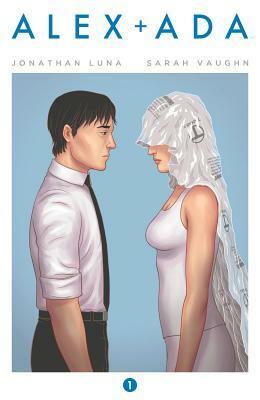 Published 12th November 2014 by Image Comics. 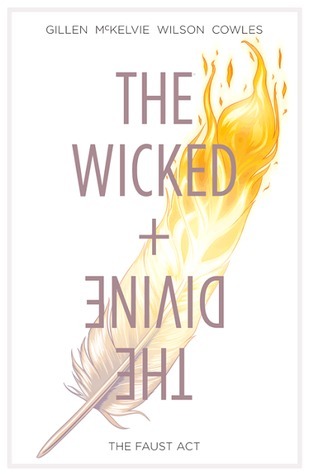 My Review: I can’t even begin to describe how excited I was about reading The Wicked + The Divine, when I spotted the first volume in Waterstones! I had been reading a lot of tweets about it on Twitter as the individual issues were released, but had to wait until the volume was published as I missed the first issues. There was so much hype surrounding this! And, of course: Gillen, writer, McKelvie, artist, and Wilson, colorist, are the super team that created Young Avengers – without doubt the best series I read last year. The concept really intrigued me: Re-incarnated gods… as pop stars? It sounded crazy but inventive (And there are some really interesting ways to look a the concept); I was sold. The Wicked + The Divine had me completed gripped from the opening pages and I read the entire volume in one go (then cried a little a lot). The plot was such a good crime story, laced with paranormal elements (and some really cool outfits. ): Luci is seemingly framed for murder, and locked away in prison, so London student Laura decides to investigate and find the truth, investigating into the somewhat sinister worlds of the re-incarnated gods. On the mythological side of the story, I think I missed some references; I read on Goodreads that the Gods all relate to different famous legends, which brings a whole new depth to the plot: I’ll have to reread it! Jamie McKelvie’s illustrations, along with Matt Wilson’s beautiful colouring, were flawless. I loved the artwork in Young Avengers, so I knew I would enjoy the art in this series. The whole comic was drawn so beautifully: I loved how the Gods, particularly, were drawn. The outfits and the hair were SO cool. I will disappointed if I don’t see cosplay… OH WAIT LOOK AT THIS AMATERASU ONE OHMYGOSH. Overall, The Wicked + The Divine, Vol 1, was definitely as great as I hoped it would be – and worth the wait to read it, too. I’m so excited about reading on in the series soon! I’m sure it will be a future classic. 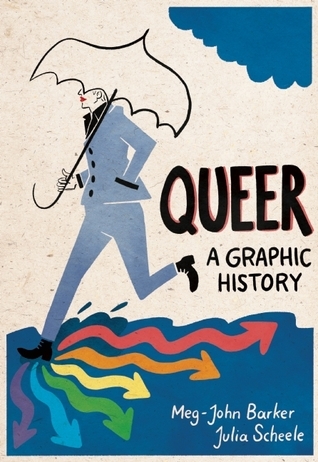 Gillen has crafted a truly individual story that had me completely absorbed, and I can’t even describe how much I loved Jamie McKelvie’s illustration. I’m counting down until Volume two now… because AGHHH THAT ENDING. I purchased a copy of The Wicked + The Divine in a local bookstore. This entry was posted in Uncategorized and tagged adult, comic, comics, gods, graphic novel, graphic novels, image, image comics, jamie mckelvie, kieron gillen, matt wilson, mythology, paranormal, the wicked and the divine, wic div on January 8, 2015 by keithbwalters. 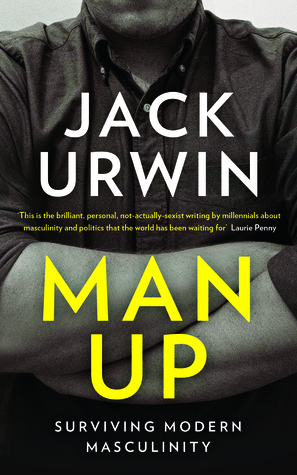 Published October 23rd 2014 by Bloomsbury. Goodreads Synopsis: On the eve of her wedding, a young queen sets out to rescue a princess from an enchantment. She casts aside her fine wedding clothes, takes her chain mail and her sword and follows her brave dwarf retainers into the tunnels under the mountain towards the sleeping kingdom. This queen will decide her own future – and the princess who needs rescuing is not quite what she seems. Twisting together the familiar and the new, this perfectly delicious, captivating and darkly funny tale shows its creators at the peak of their talents. 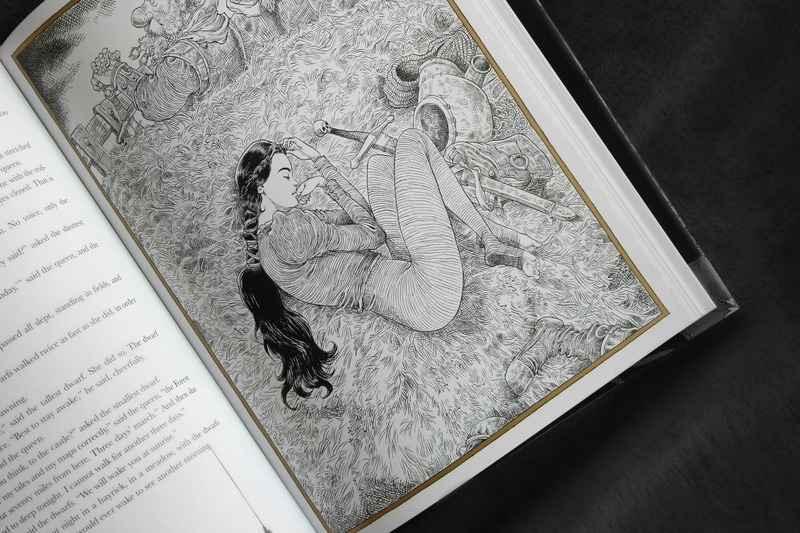 My Review: Chris Riddell and Neil Gaiman are a brilliant storytelling pair – as I knew from reading Fortunately, the Milk, their children’s book. Neil Gaiman’s writing is always gorgeous and Chris Riddell’s illustrations always bring to life his characters in an unforgettable way. 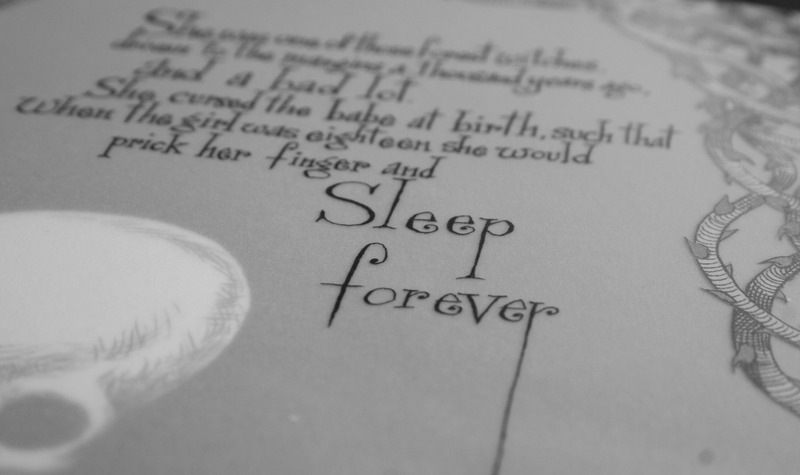 Consequently, when I found out about The Sleeper and the Spindle, I was really excited about reading it! The book is one of the most beautiful editions I’ve ever come across. The cover made me want to start reading straight away (Which I did!) and the minimalistic colour palette of black, white and gold makes the beautiful illustrations stand out. I fell in love with the look and feel of the book before I’d even started the story! I know it’s a book I’ll treasure. 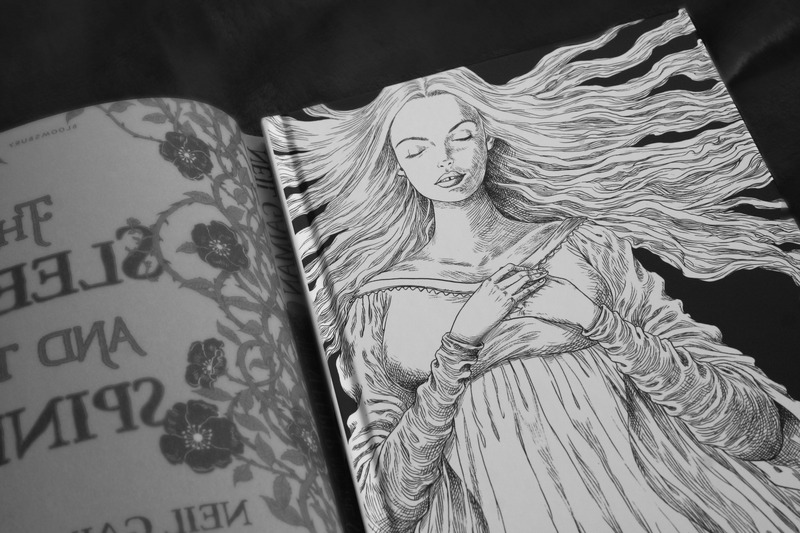 I’ve been a fan of Chris Riddell’s work for years but I think his illustrations in The Sleeper and the Spindle are my new favourites – especially the two-page spreads and the endpapers! The character depictions are all so beautiful. I was aware the story would be a retelling of Sleeping Beauty – but didn’t realise that the clever twists would draw in Snow White too. The only reason I was a little nervous about reading it was that I wasn’t sure how I’d find it because it was a rewritten classic – would it stand out enough? There’s quite a big market in fairy tale re-tellings. I’m not sure why I thought that; Neil Gaiman’s spin on the well-known stories was fantastic, and I didn’t want to pull myself out of the story. What I loved the most was how the classic story is there, but the stereotypical stock character’s aren’t. There’s no prince charming. Instead, the protagonist is Snow White, who leaves her land, delaying her marriage, to awake the ‘sleeper’ in her castle, while the sleeping plague sweeps over the land. It’s so fresh and different! I really liked the ending too, which left the story at a point that left me wondering about the character’s unwritten futures. Overall, The Sleeper and the Spindle definitely lived up to my excitement, though at just under seventy pages I do wish it was a little longer – I fell in love with the story so much. It’s a wonderfully fresh take on Sleeping Beauty – and a clever continuation of Snow White as well! The illustrations that accompanied the writing were gorgeous, and I think they fitted the story perfectly. Definitely recommended – The Sleeper and the Spindle will appeal to readers regardless of age. I received a copy of The Sleeper and the Spindle form the publisher, in exchange for a review. In no way at all did this affect my thoughts. 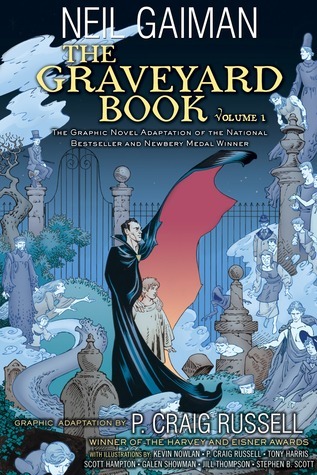 This entry was posted in Uncategorized and tagged book, book review, books, chris riddell, graphic novel, neil gaiman, new release, the sleeper and the spindle on November 3, 2014 by keithbwalters. Published 2011 by First Second books. Goodreads Synopsis: Anya could really use a friend. But her new BFF isn’t kidding about the “Forever” part. Or so she thinks. Spooky, sardonic, and secretly sincere, Anya’s Ghost is a wonderfully entertaining début from author/artist Vera Brosgol. 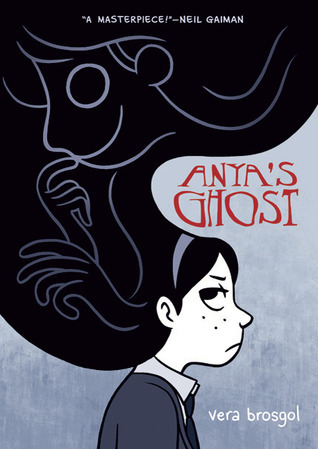 My Review: Anya’s Ghost was such a brilliant graphic novel! It caught my eye in the library earlier in the month, and I’d read a couple of great things online. I couldn’t wait any longer to read it… Whilst in the middle of loads of titles, I picked it up. Once I had, it was hard to put down! It’s original, compelling, and has some of the most beautiful illustrations. I wasn’t expecting so much from the 200 page story. It deals with an insecure teenage girl who doesn’t quite fit in, paranormal murder mysteries, and above all friendship… it’s all blended together to make a really emotional and addictive story! I guess I do read a lot of paranormal books… but none that deal with friendship as opposed to a romance story which is more often seen. This story made for a really fresh look on things. And it quickly turns from heart-warming to sinister and terrifying… I really wasn’t expecting the plot twists! Anya was a very relatable character; she’s a teenager under exam pressure, finding it hard to fit in with anyone in school, struggling to maintain a friendship with the one girl who hangs around with her. It was easy to understand her and I grew really attached to Anya! She develops so much through the book, as she discovers certain things about people in her life and begins to make different and life-changing decisions. 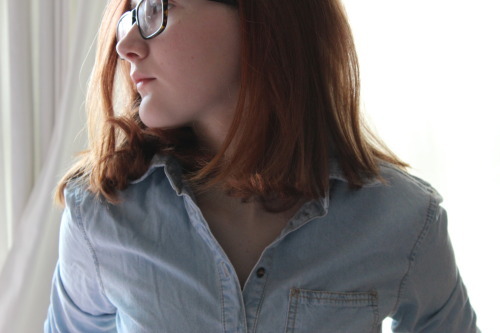 Anya’s ghost, Emily, also develops a lot in a really unpredictable way. She’s a really complex and unpredictable character. I didn’t see the ending for the story coming. The artwork is absolutely beautiful. The style of drawing is simple and cartoon-y, but it really just… went with the story. I loved it. I was really absorbed in the drawings, and I found myself going back over pages after I’d finished just to admire some of the panels! The colour scheme is really pretty, all dark shades of grey and purple. Overall, I’d really highly recommend Anya’s Ghost to anyone, whether you’re a reader of graphic novels or not! The story was really complex and riveting, with some unpredictable twists that leave readers in a daze. Vera Brosgol has created some very memorable characters that I was left thinking about long after the last page. It was breathtaking, and probably one of the best débuts I’ve read in a while! I borrowed a copy of Anya’s Ghost from my local library. This entry was posted in Uncategorized and tagged american, death, friendship, ghost, ghosts, gothic, graphic novel, high school, paranormal, well on May 26, 2014 by keithbwalters.